Virginia Woolf, the War Without, the War Within: Her Final Diaries and the Diaries She Read – loudlatinlaughing – Euge! Euge! 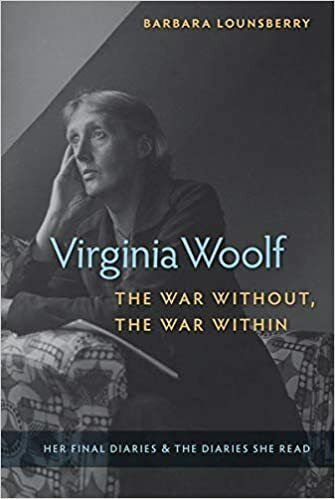 The final installment of Barbara Lounsberry’s valuable contribution to VW scholarship, this book covers Woolf’s diaries from 1929 to 1941 (book one 1897-1918, book two 1918-1929). This look at Woolf’s diaries and the diaries she read was less interesting than the other volumes, although I did pick up recommendations for Alice James’s diary and reinforced the idea I need to eventually finish reading Gide’s diary. As always, Lounsberry does a great job picking apart how the diary influences Woolf’s other published work, her grand exhaustion over The Years, her use of one work to balance out another. Oh! And the Michael Field diaries, the pseudonym of an aunt & niece combo who wrote poetry but who suffered much abuse from the male establishment, by way of Ruskin, giving Woolf much material for On Being Despised. I want to write another 4 novels… & to go through English literature, like a string through cheese, or rather like some industrious insect, eating its way from book to book, from Chaucer to Lawrence. This is a programme (1932). And in 1939: “I take my brain out, & fill it with books, as a sponge with water”. My interest is only increased in setting aside all my attention to the VW project and working my way through her enormous mound of words, piece by piece.